Last month, we looked at the Michael Jordan v. Jewel Food Stores Seventh Circuit appellate decision in some detail here. But there was more to this decision—a reversal of the district court’s finding that a tribute ad constituted fully protected First Amendment speech—than what was decided. The appeal had a favorable outcome for Jordan, who got the lower court’s decision tossed and his case remanded, and who will likely be compensated handsomely for his persistence. But did Jordan’s legal team miss an opportunity to double down on his chances for success and establish some important precedent in the process? As we noted back in March, the Seventh Circuit’s well-reasoned opinion gave us a fair amount of clarity into the whole commercial/non-commerical speech imbroglio; permitting us to rest easy in the knowledge that a tribute ad from a for-profit business congratulating a celebrity, no matter how potentially newsworthy or lacking in a sales message it may be, is commercial speech (at least in the Seventh Circuit). 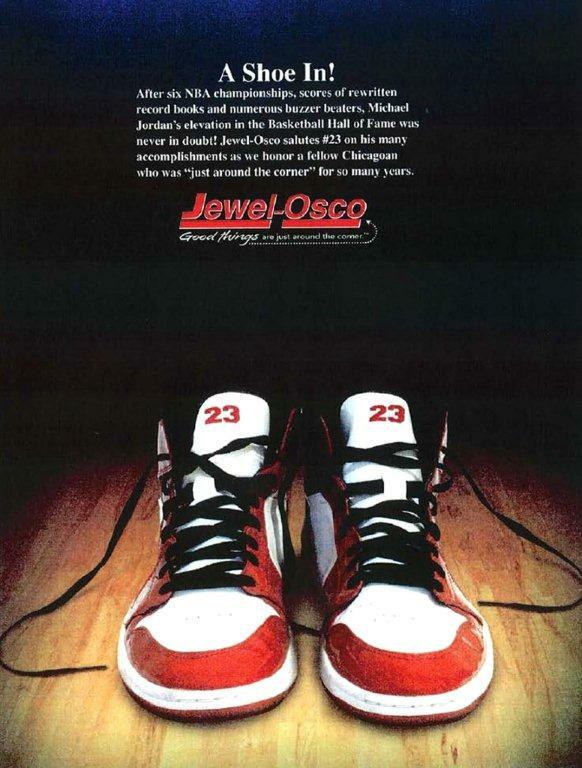 The decision, which affirmed Michael Jordan’s right to seek $5 million in damages from the Jewel-Osco supermarket chain for missapropriating his persona for its own benefit, is a cautionary tale for any advertiser thinking about running a local tribute ad as part of its grassroots marketing strategy. I’m not so sure either. Is this simply another case of a distinction without a difference? Possibly, but it’s a discussion the Seventh Circuit thinks is at least worth having. The Supreme Court bestowed upon commercial speech its modern definition in a string of First Amendment cases in the 1970s, the most notable being Central Hudson Gas and Electric v. Public Service Commission of New York. It did so to establish a threshold question for what is now known as the commercial speech doctrine, a test for determining the correct standard to apply to government restrictions on advertising. That definition was “speech that does no more than propose a commercial transaction.” And while the definition has slowly evolved in the years since Central Hudson, its underlying purpose has not: to instruct courts in the appropriate level of scrutiny to use when reviewing government regulation of private speech. It is not, or at least never was, a means for settling civil disputes between private parties brought under the Lanham Act, state publicity statutes, or any other body of law. And I think this is where the Seventh Circuit is leading us with their three-page aside in the Jordan opinion; to question the logic of viewing “commercial speech” and “use in commerce” as interchangeable. While the two may in fact turn out to be the same, by raising the question, the Seventh Circuit is implying that, as a matter of law, they might not be. At the very least, it’s suggesting there should not be an automatic presumption that the two are synonymous absent some authority that stands directly for such a proposition. Clearly there are laws that allow private plaintiffs to challenge First Amendment speech irrespective of commercial status; libel and slander being the two that come immediately to mind. But defamation is considered a tort, whereas trademarks, and in most states (including illinois) the right of publicity is a property right. So copyright law might be the better analogue. Copyright is a property right that, just as with trademarks, allows for fair-use exceptions that help avoid unnecessary brushes with the first amendment. The Copyright Act mandates that the “character and nature” of a use must be taken into account for the purpose of determining fair use, and it establishes fair use exceptions for criticism, comment, news reporting, teaching, scholarship and research. Whether a use of a copyrighted work “is of a commercial nature” is given considerable weight in any fair use analysis, but copyright infringement can be found independent of commercial motivation. You don’t have a First Amendment right to erroneously claim someone else’s work as your own, even if you don’t intend to make a penny from the deception. That’s because there’s a moral right protecting the reputation of an author, separate and distinct from the economic interest. Perhaps there’s something to be learned from this concept in a publicity context. The truth is, none of this really matters in the Jordan case now. Jordan won his appeal and will be rewarded, if he hasn’t already, with a nice settlement offer. But as judicial dicta often does, it raises some interesting questions in this case that you may see pop up again in a court near you. It doesn’t take much fact tampering at all to see where a problem could arise in the future. Imagine, if you will, that instead of a supermarket chain, a controversial religious or political organization ran the tribute ad. If The Christian Coalition, Planned Parenthood, or One Million Moms was behind the effort, there’s a much better chance it would be labelled non-commercial speech. And what then if Jordan’s personal views happened to be antithetical to the organization’s, and he didn’t want to be publicly associated with it? The implication of the present decision would be that, assuming it was deemed non-commercial, Jordan would have no recourse to seek damages under either the Lanham Act or the Illinois Right of Publicity Act. And that just doesn’t seem right. The point is, there may not have been a need for Jordan to win the commercial speech argument to win this case on the merits, but he made it and won it anyway. And while that’s great for Jordan, it does little for future plaintiffs who have less compelling facts to show that a defendant’s unapproved use of their likeness constituted commercial speech. Until we have a right of publicity case that directly questions the necessity of defining a message as commercial speech before a claim can proceed, we likely won’t know for sure how the issue will be resolved. It’s unfortunate that this wasn’t that case. The content of this blog is intended for informational purposes only. The information provided in this blog is not intended to and does not constitute legal advice, and your use of this blog does not create an attorney-client relationship between you and Brian J. Meli. Under the rules of certain jurisdictions, the material included in this blog may constitute attorney advertising. Prior results do not guarantee a similar outcome. Every case is different and the results obtained in your case may be different.